(first posted 11/28/2012) A few months back, I showed a stretch ’65 Pontiac posted at the Cohort. 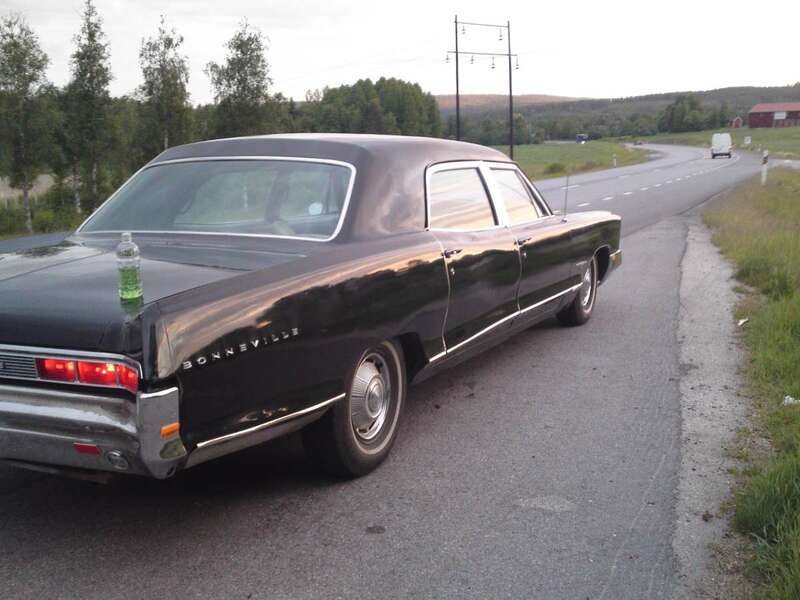 Mike Lindholm, from Sweden, found my post and has added pictures of his own ’65 Pontiac Embassy Nine-Passenger Limo by Superior. Having never looked over one of these rare cars, it seems fitting that I share them here. Hi, I got one here in Sweden. There were only ten made in the world of this model; four were imported to Sweden, five are in the states. The last one? We don’t know where it is. But this is the real thing and not a Photoshop. Only ten made? Well, it wasn’t exactly a common sight on the streets, that’s for sure. So let’s open her up and take a look inside. Technically, there really is room for nine. With all that room under the second row, leg room actually doesn’t look too bad. Here’s the ad for it, as posted in the comments there by roger628. And what’s my contribution? I identified those wheel covers for Mike. He was wondering where they came from, since they’re not standard issue for full-size Pontiacs. 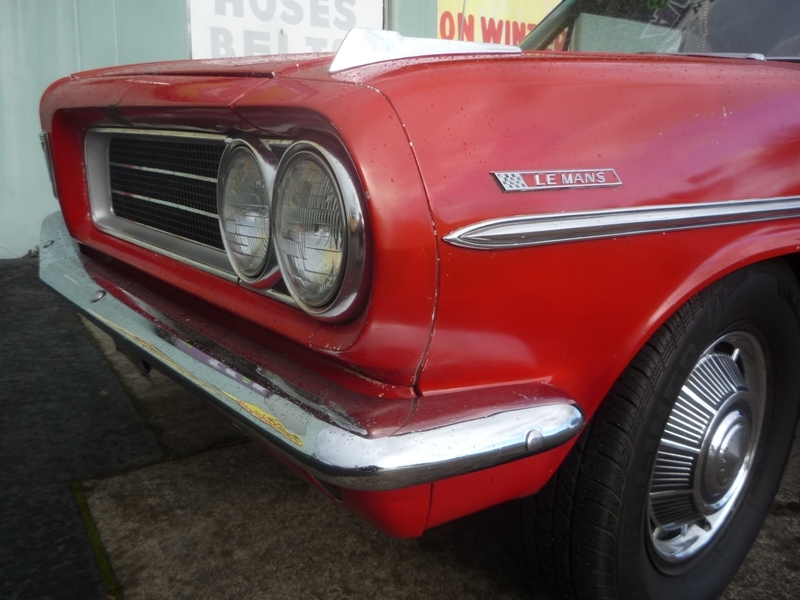 They are, in fact, those from the ’61 – ’63 Tempest/Le Mans–but why? It’s because those little compacts rode on 15″ wheels versus the full-sized Pontiacs’ 14-inchers. Superior obviously wanted fifteens on that big limo and these would fit. For some reason, they don’t appear in the last photo of Mike’s limo. Mike says he did lots of hard metal-work on this car; I assume he had to restore and paint the body. Looks good…now, how many kids did you say you have, Mike? Makes you wonder what was going on in the back seat during its career. Just look at the wear, as opposed to the driver’s seat – which, if anything, you’d expect to find worn out. Probably used for funerals for many years, so many people climbing in and out of it several times a week. I think the front has been recovered, it doesn’t match the rear or jump seats exactly. 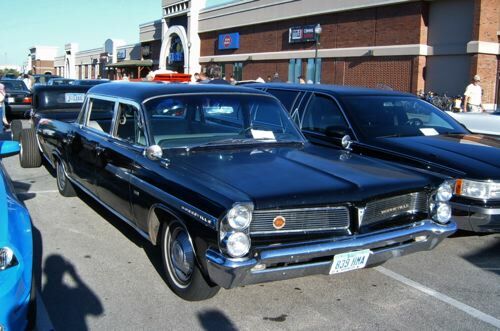 Many of these Pontiac limos were not used as limos per say, hauling around opera patrons or executives, mostly they were used as “family cars” probably following a Pontiac based hearse. The Tempest wheelcovers are used because all Pontiac commercial chassis cars used the larger 15 inch wheels. I rode in a Cadillac “family car” that was configured much like this, and probably was a rough contemporary (I want to say it was a ’67)–and the funeral was in 2007! The funeral home used it to transport us from the home itself to the cemetery across the road. This car looks like a hearse’s first cousin, which I guess it basically is. I think the use of limos for funerals is not applicaple to Scandinavia. Certainly nobody does it in Denmark. I’m surprised to see roll-up windows in this car. You shouldn’t be, as in the 1960s, only the luxury makes/models had power windows – Cadillac, Imperial, Lincoln, Olds 98, Buick Electra, etc. It wasn’t until the 1970s that power options started moving into the less-expensive cars. Even my 1969 Cadillac ambulance had roll-down windows in all four doors, along with a manual bench seat. While in auto shop class in the mid-1980s, we worked on all sorts of 1960s and 1970s American cars. It was rare to see a car that had power windows even then (I distinctly remember a 1960s Imperial that came in, and marvelled at the options on it that I had never seen before – cigarette lighters (lit up of course) in all four doors, rear heater core and air conditioning, etc. Agreed. 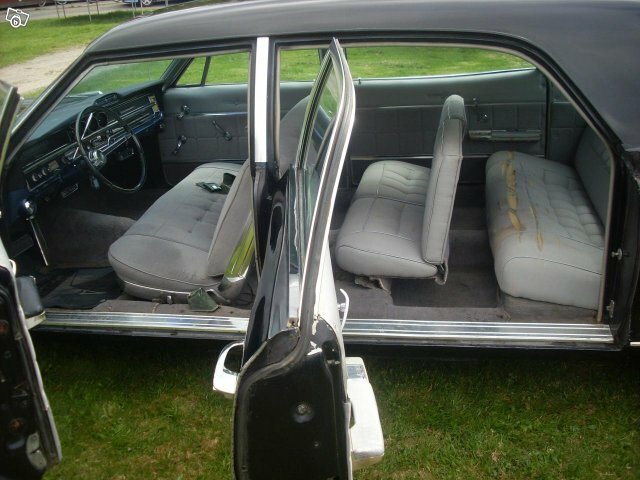 I even had a relative with a 67 Cadillac Calais that was equipped with crank windows. When my divorced mother traded her 64 Cutlass on a new 72, it was late in the model year and selection was limited. She had to take one that had power windows in order to get the bucket seats she wanted. With the a/c and power windows, I suddenly felt like we were rich. That’s not exactly true. They were optional on plenty of lower end cars in the 60s. RPO A31 got you Power Windows on a 65 Chevelle as an example. The first car that I rode in that had factory power windows was a 1953 Mercury Monterrey. That was in 1954. Now that you mention it, my car-mentor Howard once owned a 1947 Lincoln sedan that had power windows. Those were hydraulic. It was an odd sensation to get into a stationary parked car, push the button down, and watch the windows glide silently into the door. Push the button up and a distant hydraulic pump would whirrr and the window would glide up. Howard had owned several of these cars in his younger days, and said that those hydraulic systems leaked constantly, giving those old Lincolns a unique interior smell consisting of musty upholstery and hydraulic oil. The hydraulic oil was brake fluid. Still a good paint remover. In 1971 I very briefly got to drive (off-road; I wasn’t legal yet) a 1951 Cadillac hardtop coupe with power windows – possibly vacuum-operated. The 51 Cadillac would have had those hydro-electric windows with fluid lines in the doors as well. You could get power front windows on 54 Chevy Bel Airs – I’ve seen them at car shows. For a time my Dad repaired cars in the 50’s and he hated those hydro electric windows with a passion. The lines would crack and the fluid would leak onto the door sills that would then have to be repainted. I think all electric windows became predominant around 1955 or so. I’ve seen Pontiacs with power windows going back at least to 1954. 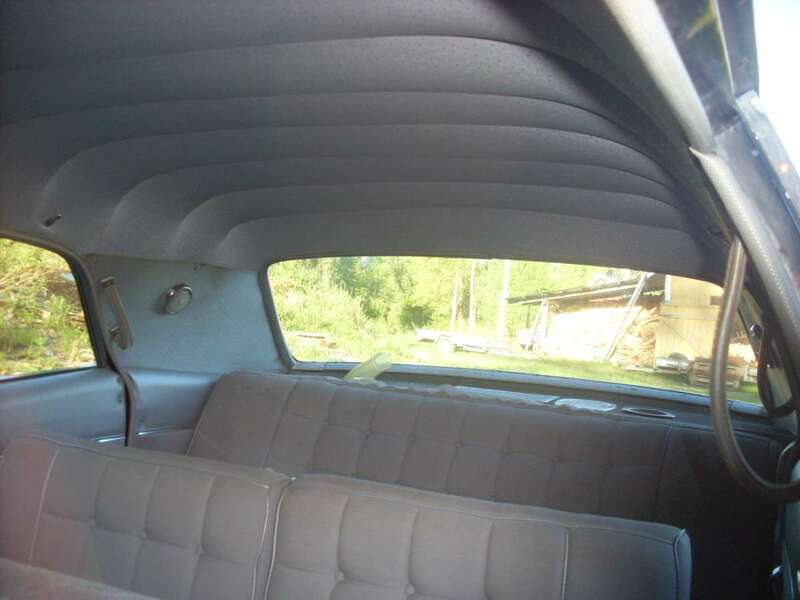 Friends in the 60’s who had new Pontiacs – a 63 Grand Prix and a 65 Bonneville – both had power windows. I’m really surprised to see them missing from a limousine of this type. Late 1950’s and my mom was dating a guy with a ’55 Olds 98 2-dr. Holiday. My big thrill was to sit in front & watch the new-fangled controls. So, I’m 4 yrs. old, we’re driving back from a picnic, and I get car-sick. They said, “Lean your head out the window until we can pull over.” (Only Marty McFly had ever heard of seat belts). But, it didn’t help. I puked into the slot where the POWER WINDOW slides down ………. shorting out the electric mechanism. For 60 years, I’ve tried to imagine the poor techs who spent the next couple of days repairing it. 1. Vomit or not, Mom did marry the guy. 2. We kept the car, until replacing it with a ’63 98. (power windows, but still no AC). Not really, I had a ’66 Chevrolet Impala that had power windows. Interestingly enough, there are quite a few unusual limousines in Sweden. Throughout the fifties and sixties, it was a must for some prominent people, like industry leaders. Usually, the were bought by the company as a perk for upper management, but also to impress and ferry important guests around. Also, it was a must for most county governors to have some sort of stately vehicle. The county governor is a kind of interesting position, with quite a lot of representation. Formerly the kings representative in the county, nowadays it’s a kind of spider in the web position between the state, the county, the industry, and the general public. Anyway, it was their daily job to represent and to be representative, and limousines was a part of that. The habit of having chauffeurs and limousines died out in the 70’s, so most cars are earlier than that. Most of those limos were coachbuilt locally, so it’s interesting seeing that Superior. Up until the 60’s, quite a few auto makers also had local factories in Sweden making cars from CKD-kits. Many of those factories were somewhere in between being full scale factories and having one foot in the handbuilt era of craftsmanship, so many of them made coachbuilt specials as well. Like ANA, later bought up by Saab. Before that, they made cars from kits by Chrysler, Dodge, Plymouth, Skoda, Standard, Lagonda, Goliath and Simca. The county governors cars was not supposed to be overly ostentatious, so many limousines were made out of simpler cars like Dodges and De Sotos and the likes. Quite a few of those coachbuilt limousines have survived from that interesting era. In your knowledge, did cars like this one play a significant role in creating the popularity of classic American cars in Sweden? Everything that I have read and heard about the American car hobby in Sweden focuses on “raggare” culture, inspired by American movies (mostly those starring James Dean), but American cars used by industry leaders and county governors must have made an impression on different (one could say more “respectable”) parts of society in Sweden. Oh yes, very much so. But it’s all part of the same origin. The swedish raggar-subculture looked to the west in the fifties, with all of that fifties nostalgia. But so did everyone else. Remember, Europe was war torn, there really weren’t any large cars for ordinary people. VW, Saab, Fiat, Renault and so on, they sold in bundles. But the European makers had none above that, and what was, was very expensive luxury like Mercedes. American cars in Sweden and Europe was not that uncommon in the fifties, the T-Ford era was only a couple of decades away. If you wanted a large car, you bought american, and that was that. The cruising scene or high society, it was the same for all. Of course, if you wanted an american car but didn’t have any money, you bought a used car. And that’s how all those interesting limousines changed hands. Conveniently enough, when they got cheap enough to buy, there were already an americana subculture in Sweden ready to take care of them. Many of those cars bought on the cheap are now worth hundred of thousands of dollars, and those people maintained them or renovated them when necessary. There’s quite a large customizing scene in Sweden, and many of those that went and became famous in the US had their roots in that subculture. That Pontiac fits the decription of those county governers vehicles I mentioned earlier. It’s a Pontiac, and not a Cadillac. I wouldn’t be surprised if that car had that background, and that the owner belongs to that subculture. If he didn’t buy used in the 70’s, someone else belonging to that crowd did. 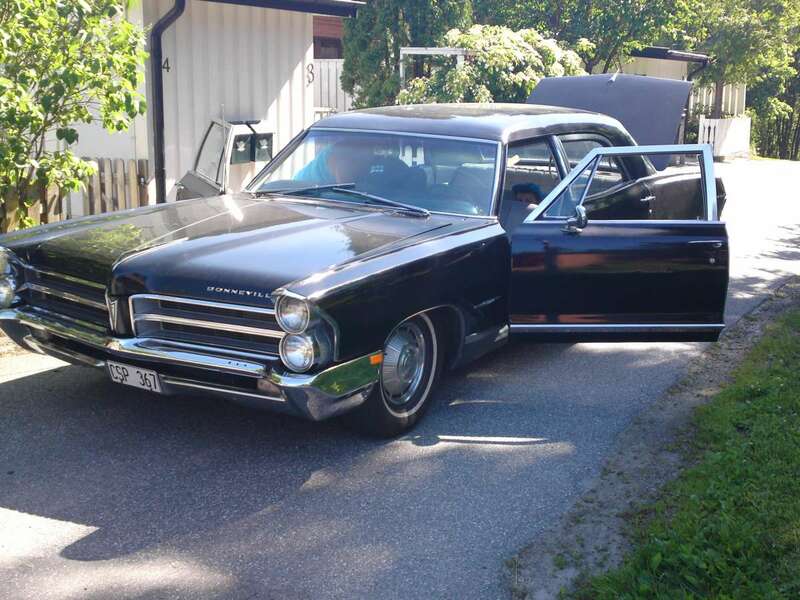 Very good comments from Ingvar, in the context of this Pontiac I just want to add the significance of a certain limousine rental car company in Stockholm, Sweden: Freys hyrverk. It was founded in 1896 and has over the decades kept lots of American limousines like the Pontiac, and Cadillacs, Imperials, Chryslers etc., in its stable. Today, they mainly perform their services with Mercedes S-klass limousines, but earlier there were almost only American luxury brands. 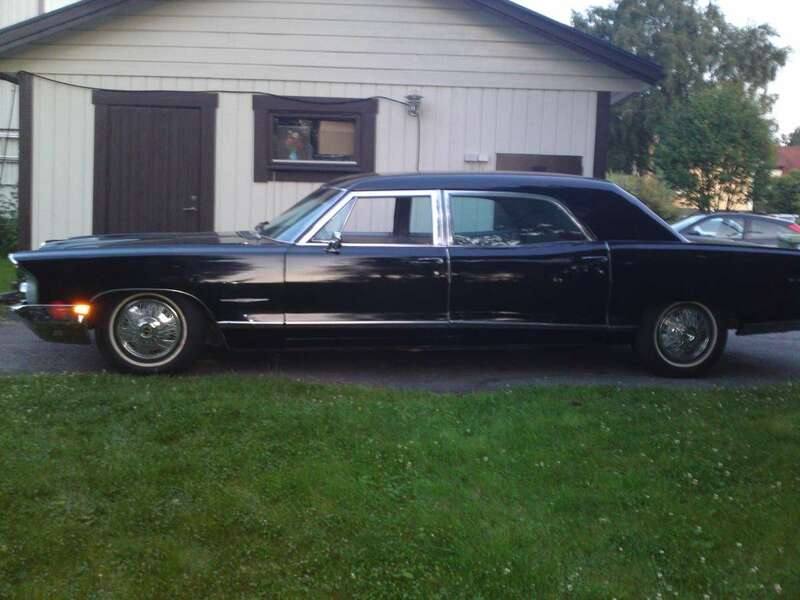 As a ten year old in 1968, I sat in the enormous back seat of a Fleetwood 75, playing with the electric windows and the cigarette lighter, in a cortege of similar cars on the way to my grandmother’s funeral at Skogskyrkogården in Stockholm – a world heritage site, by the way. I wonder how much one of these cost compared to a factory-built Cadillac Fleetwood 75. I would suspect that the prices were pretty close, which would explain the low production. Who (in 1965) wanted to spend that kind of money and get a Pontiac when you could get a Cadillac for just a bit more? The proportions are fascinating on this. They actually did a pretty good job with the longer doors and raised roof. At first I wondered why they didn’t start with a 2 door (which was what Ghia started with on the Crown Imperial limos it built for Chrysler in the 50s-60s), but then I remembered the fastback roofline on everything but the strippo 2 door sedan. This is a very interesting car, and I am glad to see it being preserved. Beautiful car thanks for sharing it with us. That baby has got some HIPS! Cool car…thanks for posting it. Two words… BAD A$$. I’d love to have one. Nice car–glad to see it’s being taken care of. I spotted a ’63 Bonneville limo at the Sycamore cruise-in in Iowa City last July. It looked to be in solid original shape. Notice that it, too has the 15″ wheels and LeMans wheel covers. That roofline is not flattering. I remember seeing these; more than once. Is it by Superior too? I believe so; that rectangular emblem on the front fender is a Superior badge, as I recall. Unfortunately I only had the single picture of it. It’s funny (to me at least) that some people see these as a kissing cousin to a hearse. Anything this long that’s painted black makes me think gangster’s car immediately. It should be packed with guys in dark suits and fedoras toting machine guns. 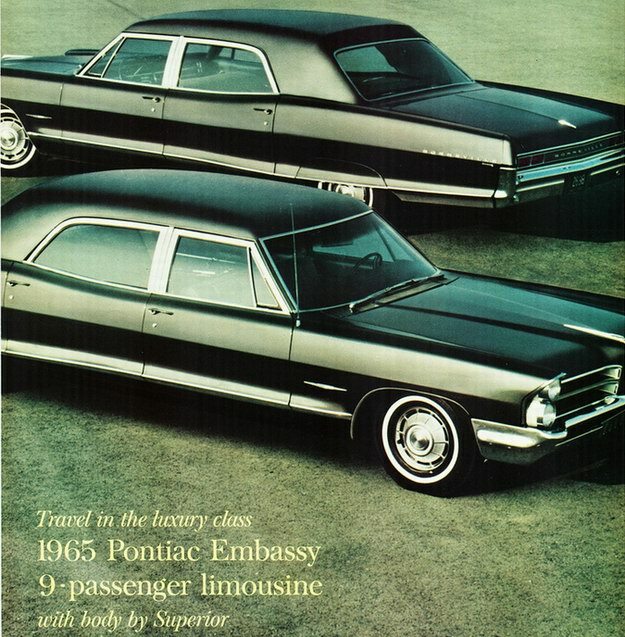 Did Superior stop building these limousine conversions after 1966? I’ve never seen a photo of a ’67. Interesting, I never have seen one either, I think there was another company making similar Oldsmobile limos, and Superior kept churning out Pontiac hearse and ambulance combos through the mid 70’s, but I think the limos ended in 1966. Part of the appeal was Handicap access ability in the cases I recall. I was obsessed with looking to see if a car had PW switches in the 1960s. Wondering why someone thought this would make a good luxury limo? Why not just buy a factory Cadillac, or spend your money converting an Olds or a Buick? Actually, I do remember in the early 80s riding in a 1975 LeSabre 6 door funeral car. I distinctly remember feeling cheated all day long. After all, how often do you get to ride in a limo? I would have much preferred a Fleetwood 75. See the explanation I posted above, usually these were purchased by lower end funeral homes that used Pontiac hearses. There were similar Oldsmobile and Buick limo/hearse combos from other makers too. Their purpose wasn’t luxury. Yep, Flixible did a couple of Buicks in ’62. and Cottner-Bevington converted Oldsmobiles for most of the 60s. The Cottners, which used the high Oldsmobile commercial windshield, weren’t nearly as well proportioned as these. I do wonder how Superior expected to make money on these – you have stretched rear doors and a custom roof. How they managed to price these sufficiently under a 75 8-passenger sedan is beyond me. back in 78 did rode a caddy limo to the air port, it has 3 rows of seat, the middle row is a bit smaller but the leg rm wasnt bad, we sat in the back though. those big body were slowly faded out. the limo was 75 or 76 still the big body. Does it have the “Ultra-Extra-Soft-Plush-Pillow-Faux-Luxo-Brougham-o-Suspension and Handling Package” as an adaptation for limo use or not? There is a 1965 Pontiac Bonneville 9 passenger limo used for funeral services with 55,424 miles for sale at an estate auction in Harrisburg, PA. It’s part of an estate auction for a Pennsylvania funeral home. Could this be the missing 1965 limo? I have a 1967 Pontiac Bonneville Embassy Limo that I was told only 3 were made that year. Been very abused by people and has started to rust because I am disabled to fix it. it was driven in 2010 the last time then someone stole the battery, took a axe to it. And now it is parked in the Florida sun. I got the car from my brother in law who passed away in 2007.It hurts me to see this car in it condition it is in, The wrecker drive who towed it here said the car was used for picking up VIPS and for motels use. and I was told Pontiac made a total of 29 cars. If any one would like to buy or look at my poor car just email. This is a very complex conversion that is so well done that it could be parked at a car show and be almost invisible from any other stock 65 Pontiac. Nice find! The Lincoln in the top photo appears to have the same, opposite side front doors installed as back doors with different window surrounds.